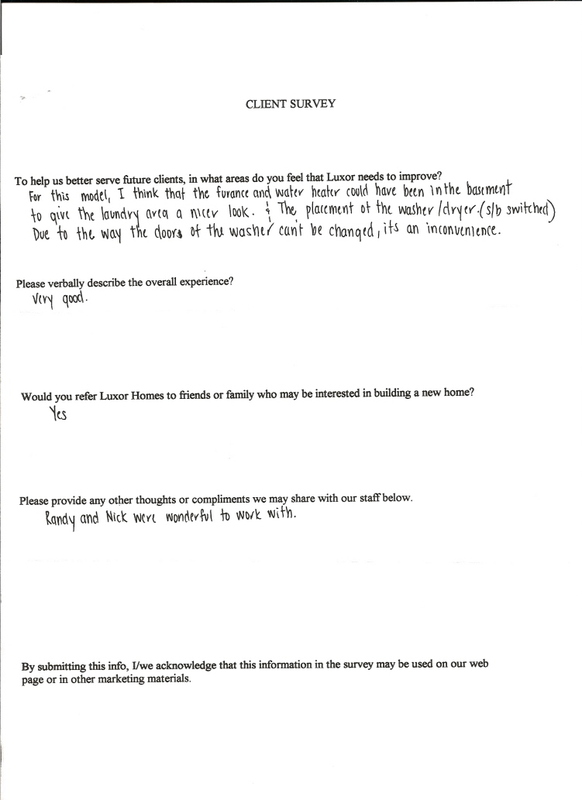 ﻿ Testimonials - Luxor Homes Inc.
At Luxor Homes, Inc., we take great pride in our workmanship and in providing a positive experience for our clients. We constantly strive to improve our products, services, and the experience of our clients. 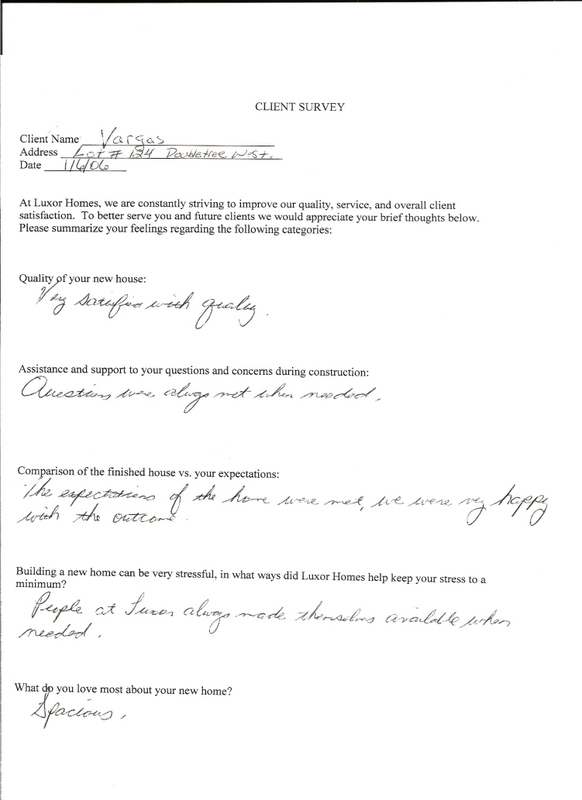 We track our client's opinions and provide a "client survey" at closing. 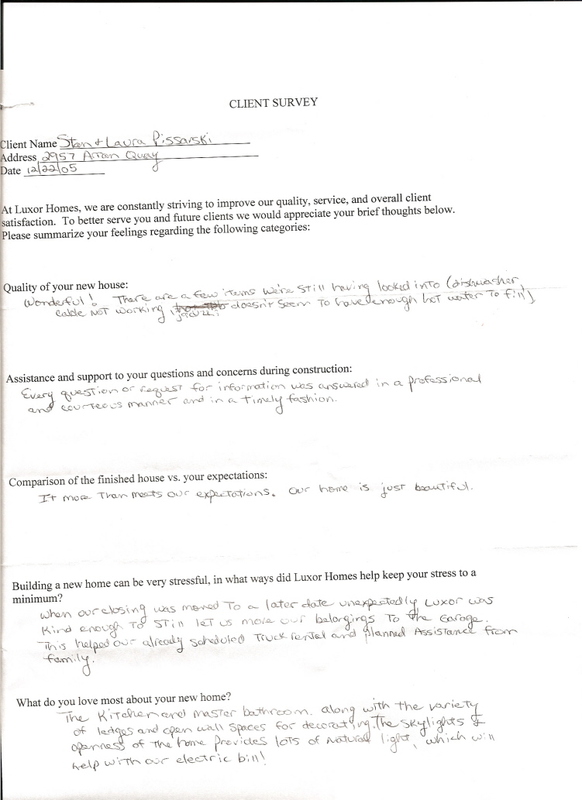 Below are excerpts from some of our many satisfied clients. 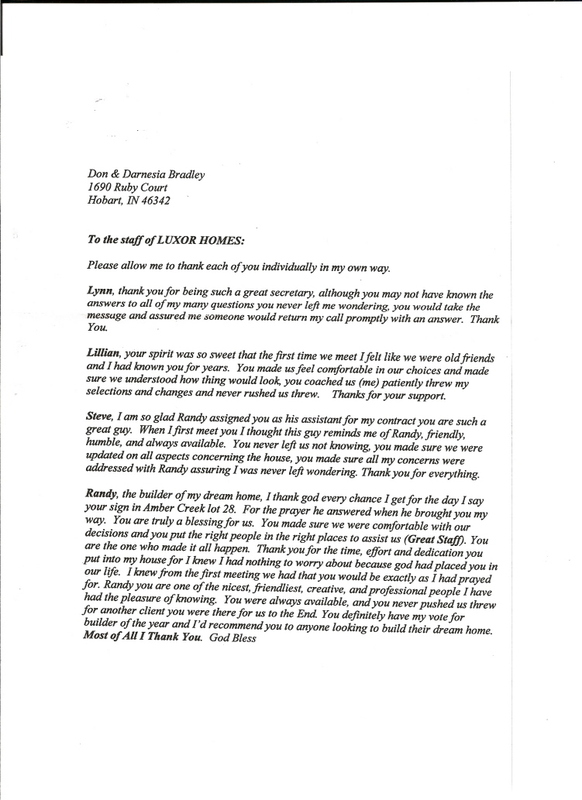 "...you'll have really been a blessing to me and my kid's and we really truly appreciate everybody in your office including Mr.Hall and exspecially tracy and tony. You have a heart of gold and a very wonderful person. We thank you for all your good work ethics .you are truly an angel." 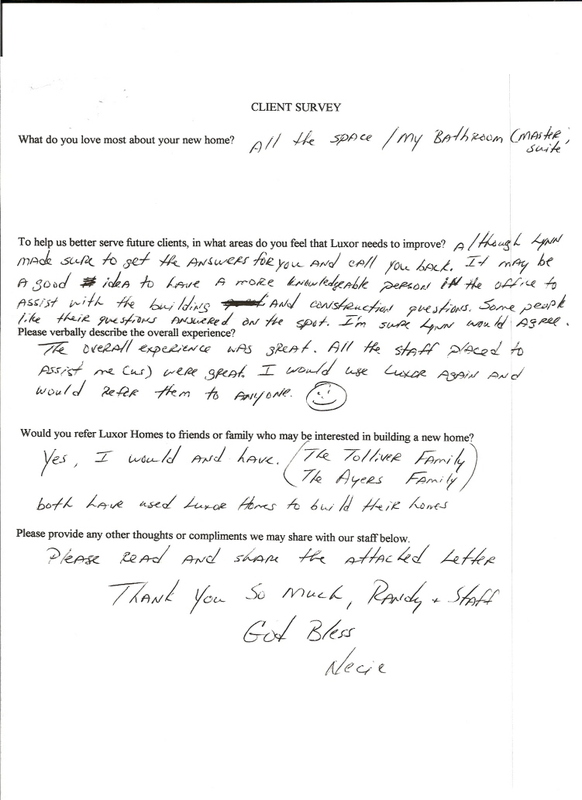 "Thank you for making our dreams into a reality..."
"My husband and I searched aimlessly for a builder that cared about what we wanted instead of what they (the builder) wanted,...Your desire to listen to us and creativity in design really shows in the finished product. Thanks Randy." "We're finally moved in and are so happy with our new house. We never thought it would happen after having our house on the market for so long...but your offering to buy our house has made everything so smooth..."
"I truly can't thank you guys enough...I mean I know it's business for you but this is our life...this would not be happening for us had you not given us the opportunity...and guidance. So from the bottom of my heart...thank you! I am so excited for us to move forward!!" 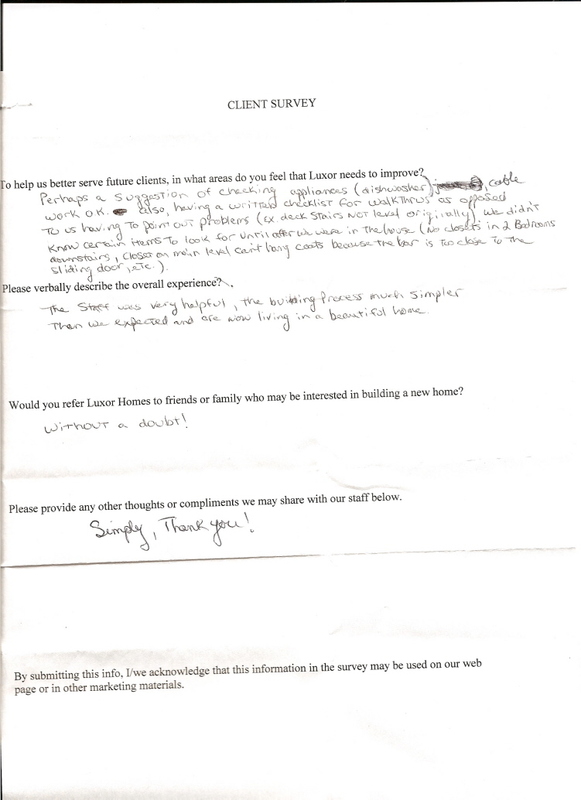 "We heard horror stories about building a new house... We've been pleasantly surprised with your staff's efforts and quick responses to our questions. 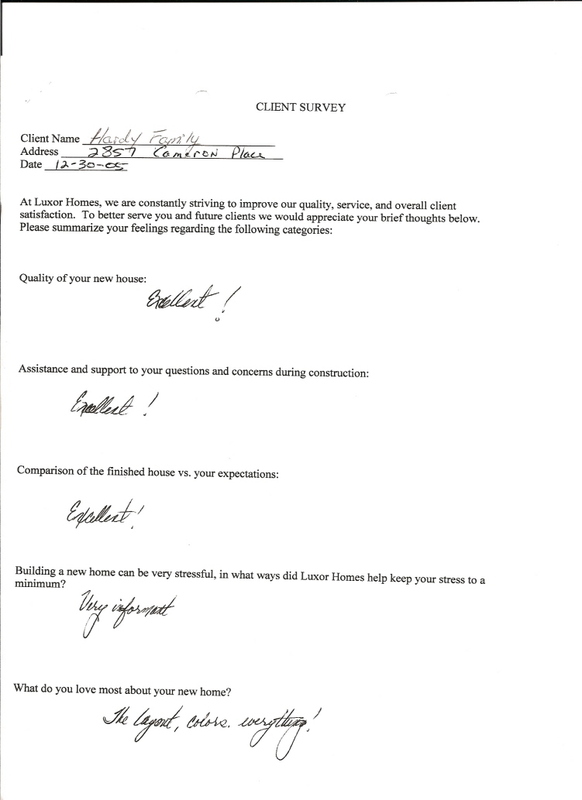 We will definitely recommend you to our friends....."
""We didn't think we could ever afford a new house with everything we wanted. 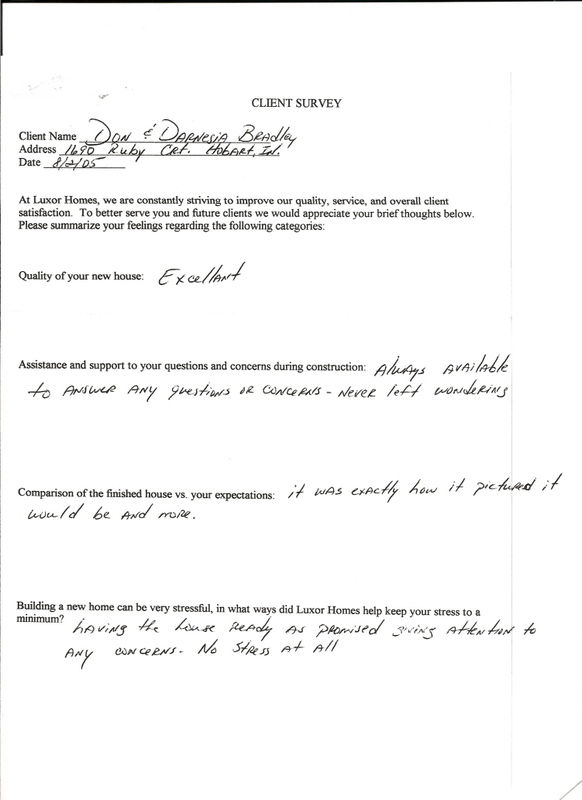 You helped us start construction before we sold our house and were patient with us when things didn't go exactly as planned. 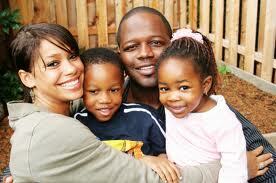 We wouldn't have a new house if it wasn't for your efforts. " 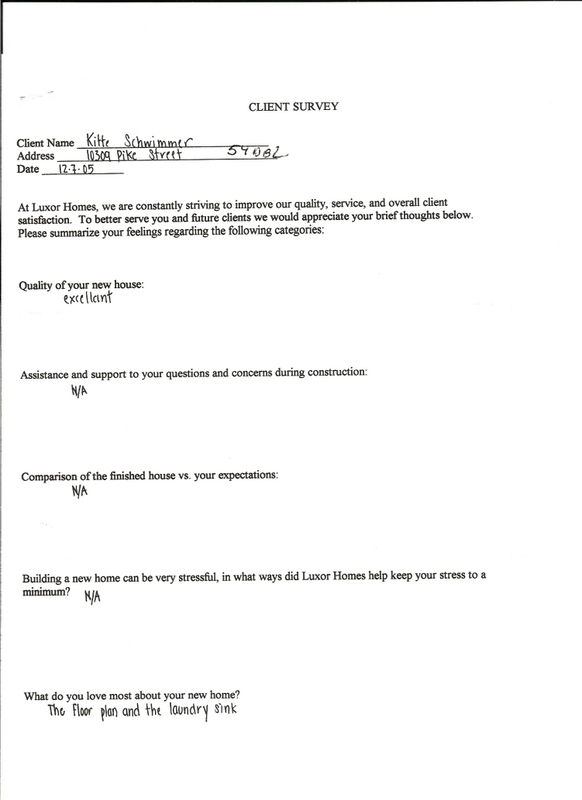 "We cannot tell you enough how much we appreciate your honesty and business ethics. 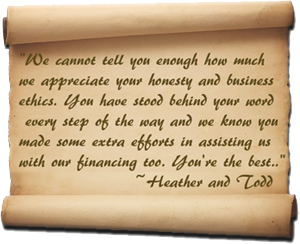 You have stood behind your word every step of the way and we know you made some extra efforts in assisting us with our financing too. 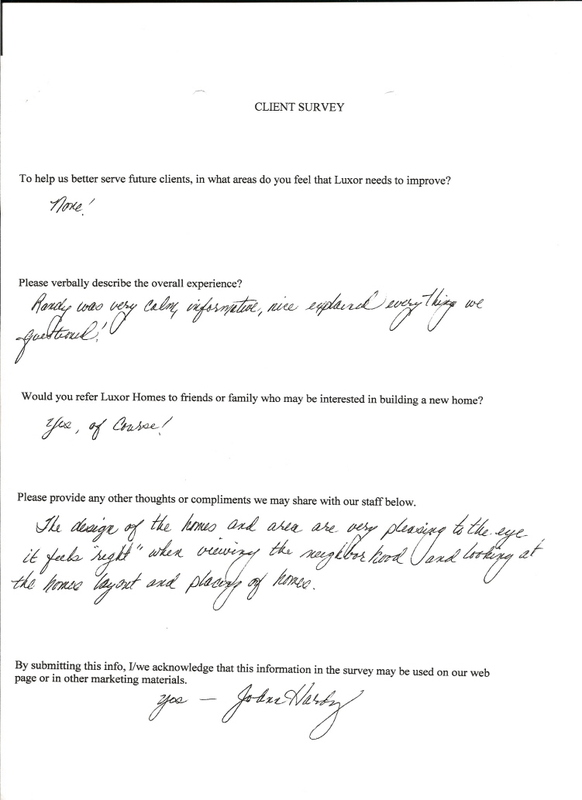 You're the best..."
"We strongly recommend Luxor Homes to anyone looking for a new home. We searched for homes for over three years and researched most subdivisions and builders in Lake County. 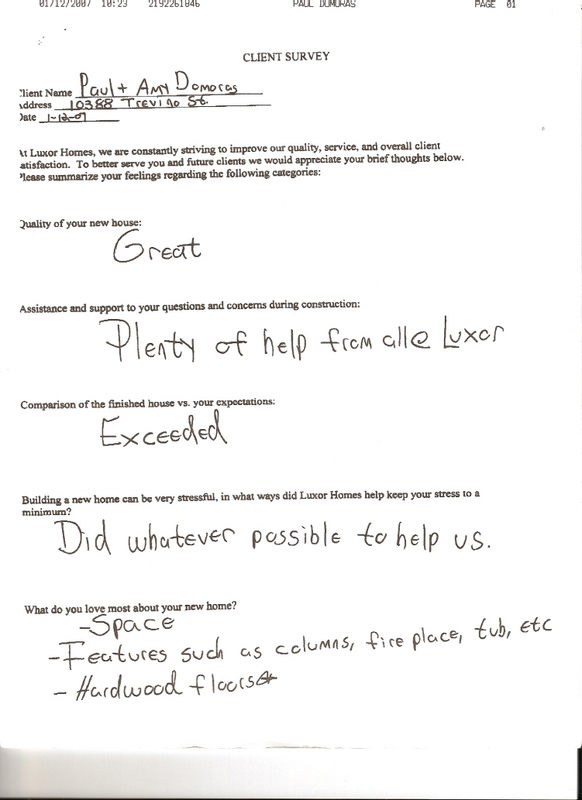 In looking at homes in our price range, we remember that Luxor Homes had the most detailed amenities on the market. 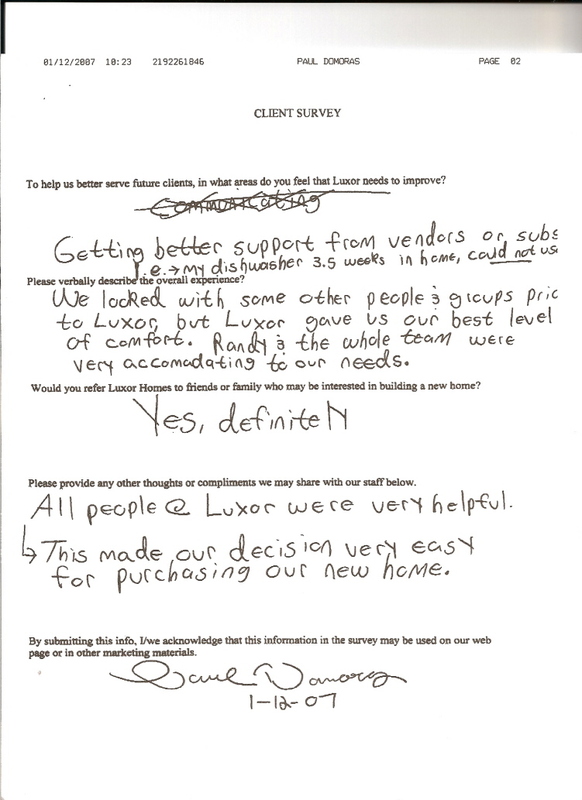 When we were finally ready, we contacted Randy at Luxor Homes to see his latest home designs. We selected the Glenn II two-story design which was a partially finished model at the time. Randy worked with us to customize many color selections and details of the home. He also agreed to analyze the value of our home so we could list it. Randy sold our home in a turbulent market in just 90 days, reduced his realtor commission to make the numbers work, helped us negotiate the price, and even had his subcontractors replace the roof when required by the Sellers. 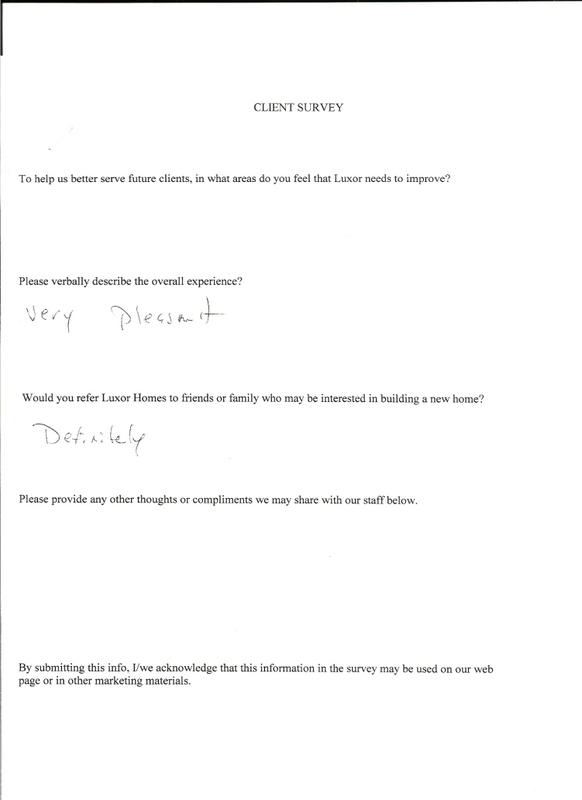 There are many builders out there, but Luxor is definitely one that will deliver top notch quality, well constructed, and well priced homes with great professionals that are a pleasure to work with." 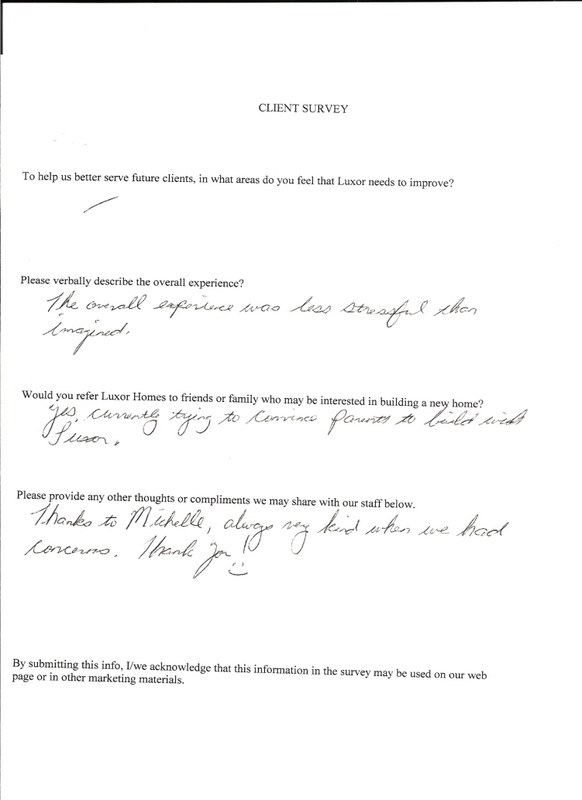 Choose a Testimonial: Angela - "I think you guys are wonderful!" Bradley - "Thank you for everything." Bradley - "No stress at all." 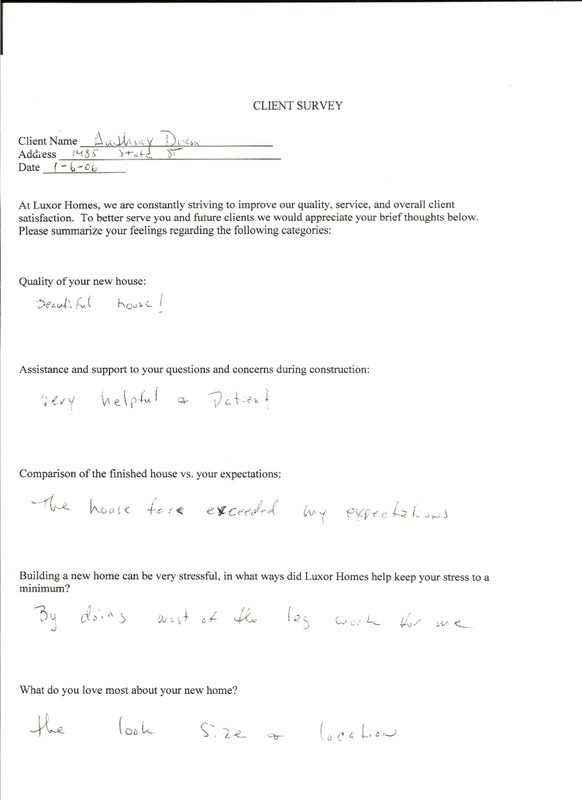 Anthony - "Very helpful and patient." Domoras - "Did whatever possible to help us." Hardy - "Excellent!" Pissarski - "Our home is just beautiful." Schwimmer - "Randy and Nick were wonderful to work with." Vargas - "...always very kind when we had concerns."